The Tide Minnow Slim 140 enjoyed its popularity among surf fishing anglers, and the long awaited full model change has arrived. With the modifications on the weight system, the castability has drastically improved. Further, we have adjusted the action and body balance to better suit the ever changing rough conditions in the surf. We have fine tuned its specifications to better suit the surf game today. To put it into perspective, this new model will feel a little like a model between the Tide Minnow Slim 120 and the 175. For the moving weight system, the original model used a steel ball which attached to a magnet while swimming, whereas the new model changed to a free-moving tungsten ball. In addition to the change in the weight system, we sharpened the outline of the rear end of the body to reduce air-resistance. With the installation of the heavier tungsten ball which transfers more smoothly within the body, we were able to realize a more stable flight posture resulting in a 10% increase in casting distance. While maintaining the popular rolling action, we increased the lures water catching ability in order for the lure to sustain balance where the water tends to get rough. This helps anglers to easily feel the complicated current in the surf. 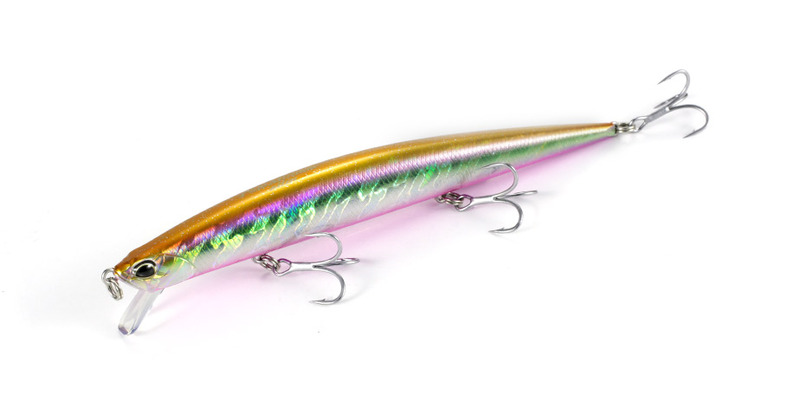 In other words, the body of the lure wobbles a little wider than the original model resulting in stronger water resistance. The swimming depth is much deeper at approximately 80 ~ 120cm, where as the original model swam at 50 ~ 80cm.